A bad start with the bat was largely to blame as Crowhurst Park’s cricketers were beaten at home to promotion-chasing Worthing. 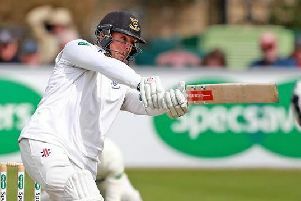 Park slumped to 10-3 and 68-7 en route to a five-wicket loss which leaves them 100 points adrift at the foot of Sussex Cricket League Division Two. In fact, Park are 102 points behind Ansty - who hold the final safe spot of third-bottom - with five games remaining. If that gap remains in three figures after this coming Saturday’s matches, Park will be relegated. Park skipper Paul Brookes won the toss and had no hesitation in choosing to bat on a sunny afternoon at the Walcott Ground. The decision looked to have backfired, though, when they found themselves in the all-too-familiar position of being three down inside four overs. Jamie Piper picked up the first two wickets and Brad Payne was then unfortunate to be caught off a Shane Felton ball that popped. Clive Tong (40) rebuilt the innings with Fox Parker until three wickets fell with the score 58. Parker was caught behind off Martyn Swift, Tong was bowled by a ball that shot through and Cameron Christie was lbw to John Glover. Rak Patel was caught in the covers off Swift nine runs later, but Colin Ayres (41 off 22 balls) and Jon Day (37 off 43) rallied by dispatching the ball to various parts of the ground. After Day was bowled by Piper, Ayres continued to find the boundary with ease before being pinned lbw by Benn Challen. Park were all out for 151 in only 33.2 overs with Matt Peters 7 not out. Pick of Worthing’s bowlers was Piper with figures of 9-3-48-3. An early tea was taken before Park took to the field knowing early wickets were required to stand any chance of a win. Payne did just that when he had Matt Green caught at point by Day with the score 10. Park’s bowlers toiled away until Payne had Sam Delaney (16) caught at gully by Ayres with the score 52. Challen was next to go after a run-a-ball 25, caught behind by Parker off Payne. Peters came into the attack and bowled under-15 opening bat Josh Wood for a mature 46 to make the score 108-4. When Stuart Carter (18) snicked one to Dale Payne off brother Brad, it gave Park an outside chance of victory. Nick Ballamy (23 not out off 14 balls) saw Worthing through to a well-deserved win, however, despite Brad Payne finishing with commendable figures of 14.2-3-56-4. Next up for Park is a long trip to mid-table Pagham. Standings (all played 13 matches): 1 Lindfield 313pts, 2 HASTINGS PRIORY 282, 3 Worthing 275, 4 Three Bridges 256, 5 Ifield 216, 6 Pagham 216, 7 St James’s Montefiore 207, 8 Ansty 196, 9 Findon 194, 10 CROWHURST PARK 94.